Our sense of reason and logic leads us to believe that babies cannot possibly begin to eat foods that are not pureed until they have teeth. Toss this faulty logic and reason aside because in reality, babies do not need teeth to be able to enjoy "table foods" or finger foods. It is logical to assume that babies will need teeth to chew, however; the teeth we chew with are the molars and not the front teeth or cuspids. It's really easy to forget and not give a second thought to the fact that foods are not chewed with the front teeth. How many of us say “My baby only has 2 teeth, how can she/he chew table foods?”. We don’t even stop to realize that the teeth that baby has are the front teeth. No matter how many front teeth are present, those teeth won’t be doing the heavy chewing and we can’t wait for molars to come in before we move on to table foods. 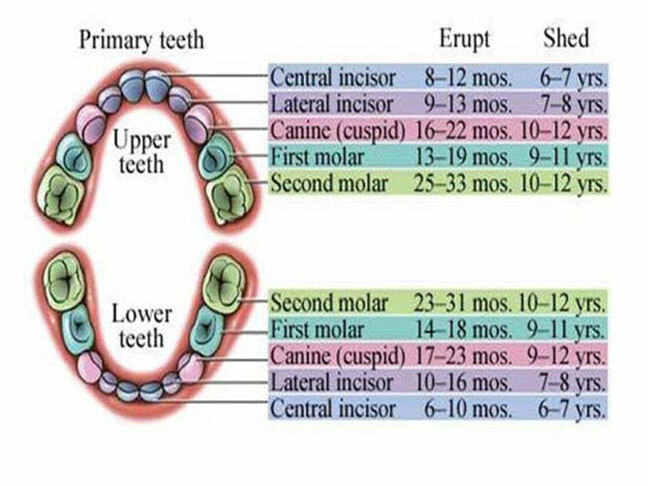 You see, babies won’t get their molars until sometime between the 12-19 month age ranges. Print out the downloadable teething chart to see approximate age ranges when baby's teeth will begin to appear. Despite the lack of molars, babies have very strong and incredibly tough gums. These little gums are quite capable of mashing and even grinding up all types of foods. Soft roasted vegetables, dices and pieces of ripe fruits and bits of shredded or grated meats are easily “chewed” between the gums. Please keep in mind that your baby should only be offered finger foods that are soft, easily mashed and age appropriate. If you are in doubt about how mash-able a food would be for your little one's gums, squish the food between your thumb and forefinger or give it a swish around your mouth. Learn more about Introducing Baby Finger Foods and Baby Finger Food Ideas.